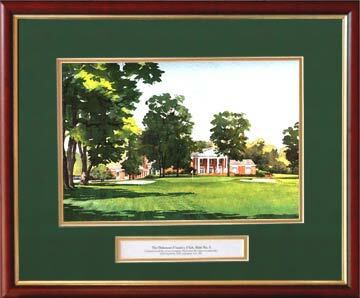 Golf Art - YOUR CLUB Commemorative Events Paintings " var s5 ="
A. Golf clubs and event sponsors to provide artwork depicting scenes of your golf course for Awards and Event Commemoratives. B. Companies or individuals for Gifts of Commissioned Artwork for advertising. 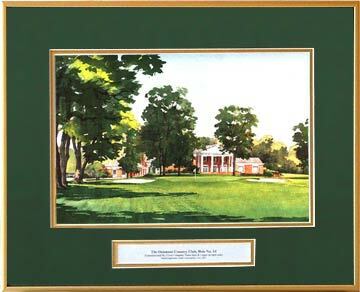 Nothing is more unique as a remembrance than fine golf art. The artwork will be hung on the wall, viewed continuously in privileged places, and provide fine art for every day and pleasant memories with every look. This is not possible with caps, shirts and umbrellas. Some clubs have given these paintings for over 10 years. The local golf club will supply photographs and slides to be used by the artist. In the event that the artist is required to visit the site to acquire the material there will be additional charges. Contact Golf Art to discuss this requirement. The text for the vignette that will appear in the mat window will be supplied by the sponsor. The vignettes may be changed so that extra paintings may be sold in a gift shop or presented for another event. The logo is optional and would be supplied in digital format. This product identifies a company as the commissioner of the artwork. The purpose is to provide friends and clients with a remembrance of your company, their gift and the event. Golf Art provides the artwork of which there are several images for your company to choose from and your company provides a logo in digital format. For an example, the 2007 US Major Golf Tournaments Series is available now with special Quantity Discounts. Format A: Double green and gold mats with customized vignette, size 13”x16”. As seen to the right without the frames. Every golf course has dozens of scenes that are memorable. The same scenes have different looks and moods at different times of the day or seasons. Early evening and late mornings provide interesting shades, shadows and play of light. These scenes may be made spectacular with artistic handling of the composition and the light. Objects in the foreground or background may be modified in the painting or painted out. Click the image above to see a larger image of this entire frame.